1H-time-domain nuclearmagnetic resonance (TD NMR) is a very interesting method in the field of cement chemistry due to its ability to differentiate quantitatively between different proton environments. A clear differentiation between solid (e.g. hydrogen in solid crystals), amorphous (e.g. hydrogen in amorphous gels) and liquid states (e.g. hydrogen in water) of proton bearing phases can be achieved with good time resolution during cementitious reactions. A combination of a the solid-echo-CPMG sequence with automated analysis and evaluation procedures by the MinErSys framework can give very detailed insights to cement hydration. The significance of this method for cement chemistry lies in the additional information on the water content of amorphous products and the evolution of porosity/microstructure. 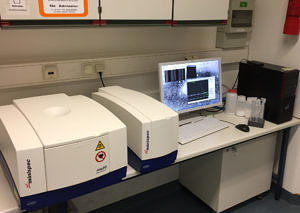 A Bruker minispec with temperature controlled probe head is available at the chair for mineralogy. Ectors et al. Cement and Concrete Research 79 (2016) 366-372. Hueller et al. Cement and Concrete Research 89 (2016) 136-144. Jansen et al. Cement and Concrete Research 91 (2017) 106-116.